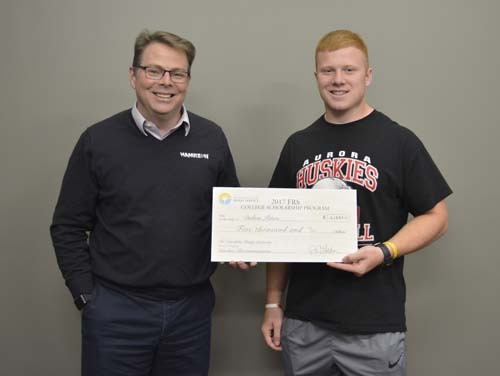 June 15, 2017 Aurora, Neb – Hamilton Telecommunications is pleased to announce that Dalton Peters was selected to receive a $5,000 academic scholarship by the Foundation for Rural Service (FRS) the philanthropic arm of NTCA-The Rural Broadband Association. The $5,000 scholarship was one of four exclusive Staurulakis Family (JSI) Scholarships, given to exceptional students who plan on studying in the STEM (Science Technology Engineering Math) field. The FRS scholarship program awarded over $100,000 in scholarships to rural youth across the United States. Out of over 1,500 applications received this year, forty seven scholarships were awarded. Four recipients were selected to receive $5,000. The goal of the scholarship program is to help further higher education opportunities among rural high school students. Hamilton Telecommunications strongly supports the youth of our community and is thrilled to sponsor this worthy program. Scholarship recipients were selected by an independent team of reviewers from the education field. To be eligible, recipients must be sponsored by a NTCA member system, and must indicate a desire to return to their rural communities once their collegiate studies have been completed. The scholarship program is open to all graduating high school seniors that reside in the Hamilton Telecommunications local service area. Applicants must be enrolled in an accredited two-year or four-year college or university, or vocational technical school, and have at least a C-grade point average.